If you are a professional or an amateur artist and wish to take part in a collective exhibition to be presented on Mount Royal, Les amis de la montagne, in association with Urban Sketchers Montréal, invite you to submit your works to Draw-me a Mountain, an exhibition of drawings and watercolour works highlighting the beauty of Mount Royal and the talents of Montréal artists. 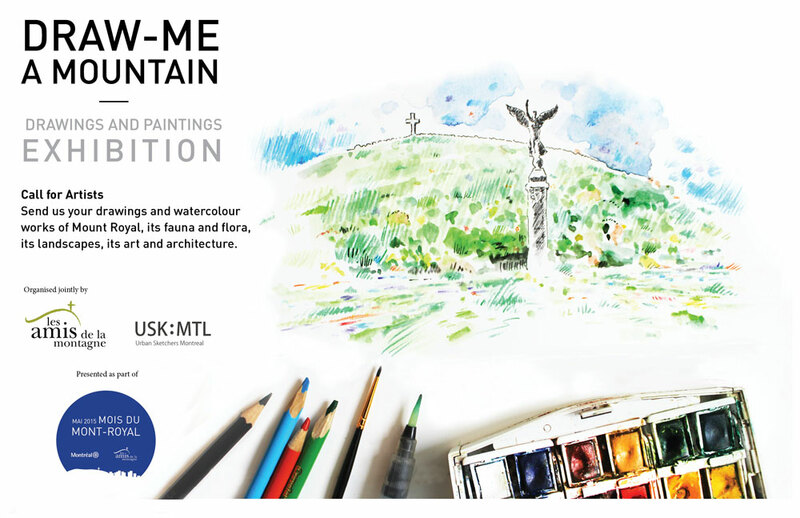 The exhibition Draw-me a Mountain will be on view as part of Mai 2015 – Mois du mont Royal, on Saturdays and Sundays throughout May, at Les amis de la montagne, in Smith House, in Mount Royal Parc. Public admission is free. 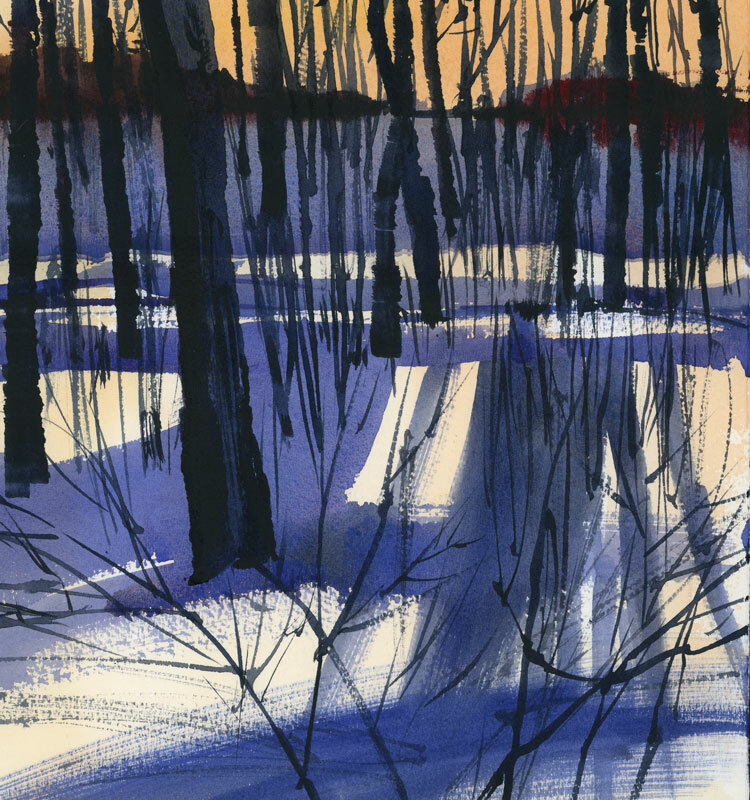 Art Day: Sunday, May 24, 2015 You are also invited to join Urban Sketchers Montréal for a day of drawing and painting on the Mountain on Sunday, May 24, anniversary of the creation of Mount Royal Park. 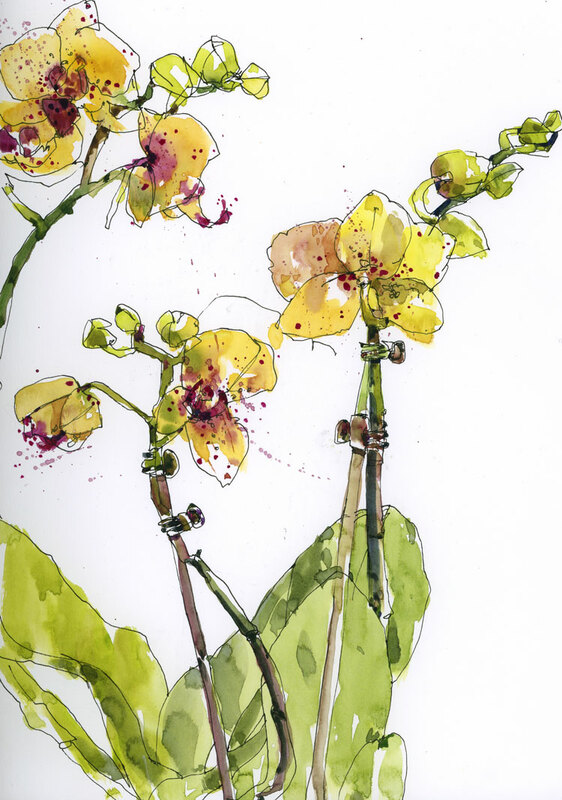 With spring flowers in mind, and knowing that I couldn’t get to the mountain to sketch today, I drew some orchids instead. This winter has been so long and so cold and so grey. With the snow piled up in small mountains everywhere, there aren’t even any good places to sketch from the car. There are days when I drive around looking for something to draw, and return home empty-handed. That’s when I realize I need a jolt of colour from the forgotten colours on my palette — the reds and greens and yellows that have sat unused while I mix up countless washes of greys. 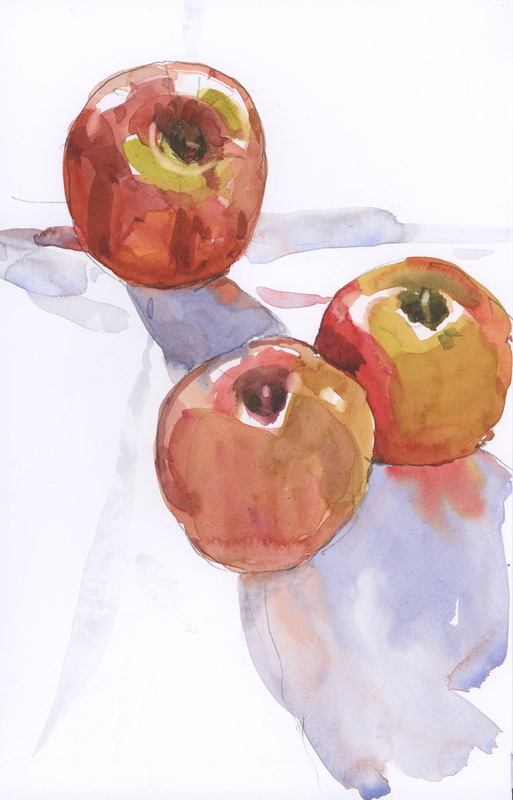 A few weeks ago for my colour fix I bought some flowers at the grocery store, and today I pulled some apples out of the fridge. Although the days are longer and brighter, we still have a long way to go before we see any green. You can probably imagine what the most difficult part of this pose was for me. I was looking at Nancy’s face from below and on the side, and it was so hard to draw. As I mentioned in my post from Monday, Nancy has a tiny face with delicate features. They are even harder to draw when she’s in a prone position, so for this I tried to focus on two things: 1. that beautiful line of her hip against the background and 2. grouping the shadows on her body into big shapes. I’ve been reading Don Andrews book Interpreting the Figure in Watercolor. He uses a technique that he calls linkage, where he unites all the shadow shapes into one. It seems easy in theory but in practice it’s not, because the transitions from light to dark are very subtle on the curves of the body, unless there’s a cast shadow. I imagine the light he uses on his figures is much sharper than what we are dealing with in our life drawing room. Nancy is a hard model to draw. Her face is tiny and her features are delicate — like a pixie — so when I draw her sitting up, her head always looks too small. I was kind of happy to look at her from this angle, despite the foreshortening. The pose was 30 minutes and the paper is Canson Moulin du Roy, which has a beautiful, soft surface that I find ideal for life drawing. It’s much more responsive to light touches of the brush than Arches (which I’ve been struggling with for weeks) and those lost edges (where her hair goes into the shadow) are easier to achieve. I just read a bit about the paper and this is the quote I find on most websites: special mass and surface sizing allows even and easy pigment spreading and wet strength. I definitely will be using this paper again. 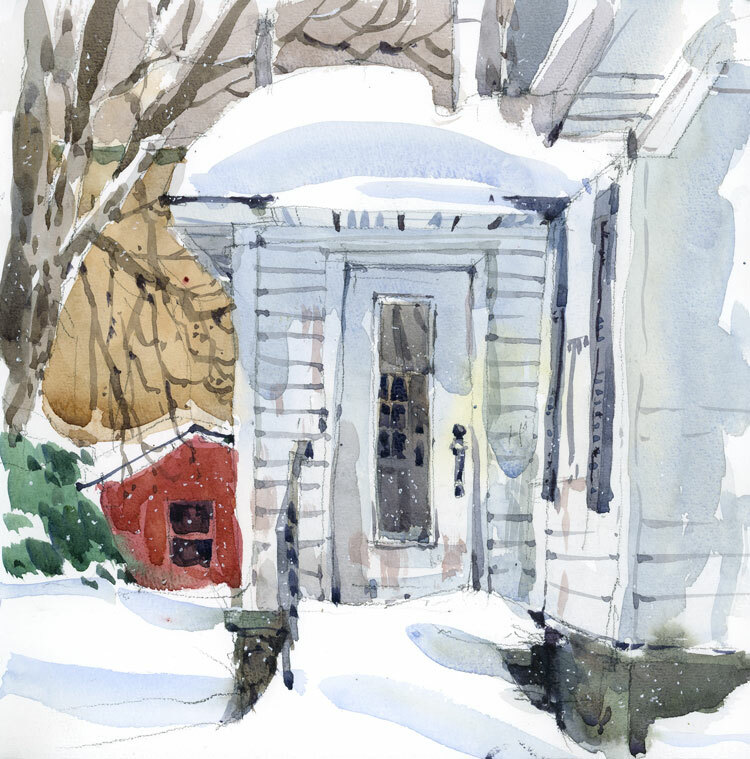 Painting a white house in snow is a bit like that exercise they make you do in art class 101 where you put some eggs in a white bowl. It’s all about the subtleties of the whites and what surrounds the bowl. Since I couldn’t rely on shadows to provide any contrast, I tried to put lots of detail and texture in the white house and leave the snow fairly untouched. I find that even though I see lots of texture in the snow, if I try to paint it, it just looks odd. Better to make a few simple brush strokes and let it be. Sketched in Ste. Anne de Bellevue, in a Travelogue Watercolour Journal, 8′ x 8″. I rarely use rough paper but thought I’d give it a try today. 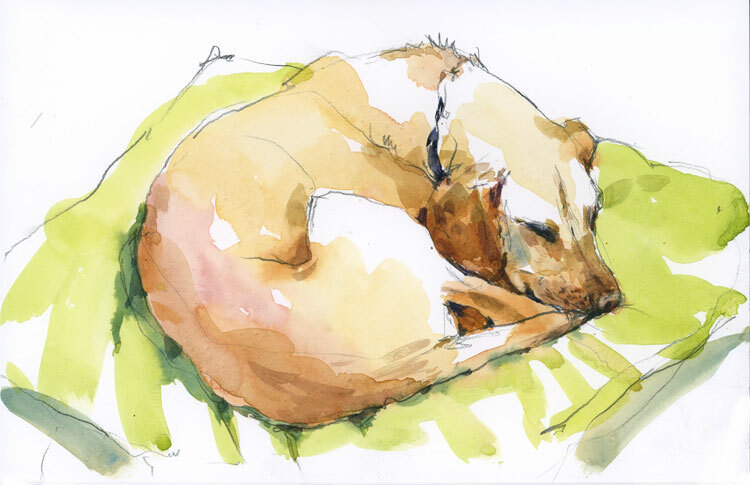 I usually find it too bumpy, but the trick, as I found out, is to use really wet washes. I generally don’t seem to mix up enough paint on the palette and end up having a brush that goes dry before it should. With this little experiment, I made sure I had big puddles of wash on the palette for the first wash of orange sky and then later for the large blue areas. And the advantage of this is that when you do want some texture, you can let that big brush go dry and run it over the hills and valleys in the paper.